Technical Car Experts Answers everything you need: where is airbag control module located on Volkswagen Jetta? where is airbag control module located on Volkswagen Jetta? 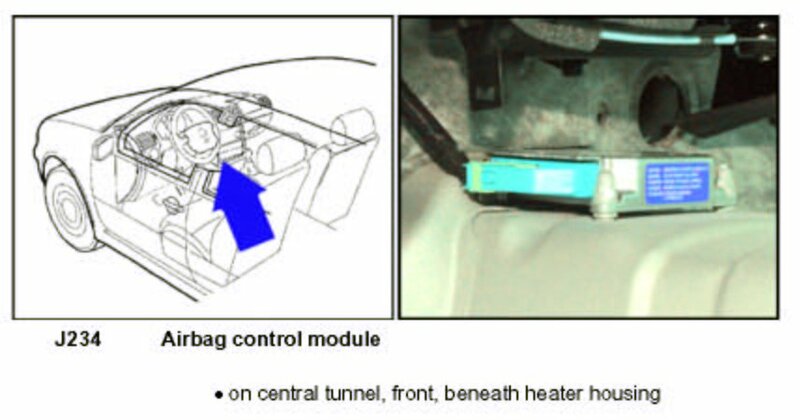 The airbag module is under the heater controls in the front tunnel. They normally have to be replaced when the airbag(s) deploy and they can be reset and or registered by an authorized VW dealership. The following components must always be replaced after an accident involving activation of airbag. Where is the airbag control module on the vehicle? ANSWER: Under the heat controls in the front of the center tunnel. If the airbag Malfunction Indicator Lamp (MIL) -K75- does not indicate any malfunction, it is not necessary to replace any airbag component. WARNING! The seat belts should be checked separately. After replacing the airbag units or the airbag control module, attach stickers (only tear-off strips) to the registration card and return the card to relevant dealer or to importer for registration. Note: When replacing either the airbag unit or the airbag control module -J234-, see your Parts Department for the proper registration procedure.